"Mom made this every Sunday and we looked forward to cold sandwiches the next day, if there was any left!! Homemade breadcrumbs work best." In a large bowl, combine the beef, onion, oatmeal, cornmeal, bread crumbs, salt, sugar, egg, tomato juice, water, barbecue sauce, 1/8 teaspoon liquid smoke and vinegar. Mix together thoroughly and place mixture into a lightly greased 9x5 inch loaf pan. In a separate small bowl, combine the ketchup, brown sugar, mustard and 2 drops liquid smoke and mix thoroughly. Spread over the top of the meatloaf. Bake at 350 degrees F (175 degrees C) for approximately one hour. Just okay. We have definitely had meatloaf we like better. Family loved it! Especialy my husband who is a big meat and potatoes guy. I realy liked the taste and texture that the different grains gave to the meatloaf. thanks for a new favorite! A super meatloaf. Don't bother with any of the others, this one rocks. Excellent consistency and tastes great on sandwiches hot or cold. 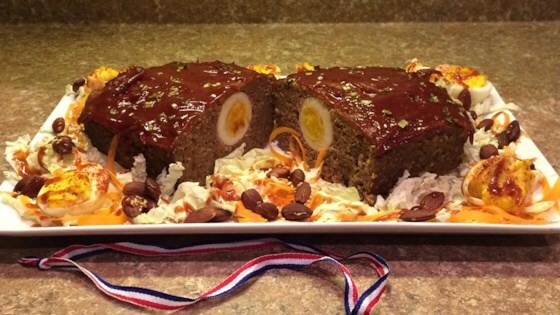 Thanks for sharing, I've found the perfect meatloaf! THE VERY BEST!!! I won't make any other meatloaf now!! Worth the time to put the extra ingredients in. FABULOUS!!! Don't change a thing! This recipe is excellent! My Mom's meatloaf wasn't this good. I added chopped green pepper and some crushed red pepper for even more flavor.